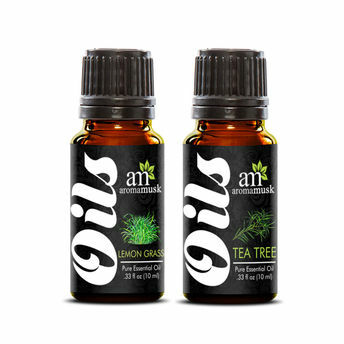 Blending the best of natural ingredients AromaMusk brings to you a combo of essential oils for physical and mental well being. AromaMusk's Lavender Oil has a scent that's a wonderful blend of fresh, floral and calmness. Lavender Oil is the most famous fragrances used in aromatherapy and perfumes. Due to its multiple therapeutic properties, lavender is one of the most important aromatic plants known to mankind. Lavender oil is known to be helpful in keeping the mind calm and soothing the body when used in aromatherapy. AromaMusk's Lavender oil can be added to your bath or shower to relieve stress. It can be massaged on your skin as an aromatherapy massage oil. But Make sure to dilute it with carrier oil. It can also be added to your hand or foot soak. Add a drop to a bowl of warm water before soaking your hands or feet. lavender Oil can be used as a compress by soaking a towel in a bowl of water infused with a few drops of lavender oil.